Sunday Riley is one of the few skin-care brands that enjoy a loyal fan base. The brand, based in Houston, TX, is responsible for many Sephora best sellers. Any new product always leads to a huge waiting list. Their upcoming new product is one that even those who closely follow the skin care industry were not expecting. Perhaps you have heard of a product called Good Genes. If you do not, this liquid exfoliator is essentially a lactic acid treatment. It has become a favorite of many skin care enthusiasts. This is largely due to its ability to make skin glow and feel smooth. However, Sunday Riley announced that they would discontinue the product in the UK. This was because of UK laws that limited how much lactic acid can be contained in a skin care product. Fans were devastated by this news. However, the company decided to reformulate the product and quietly released it back into the market in October 2018. This product eliminated lactic acid and instead used glycolic acid for purposes of exfoliation. The reformulated Good Genes product was only offered in the UK. However, that is about to change. As reported by Allure, Sunday Riley will bring the UK version to the US as a limited edition set which will be named the Early Access Kit. It is so limited that only 1000 fans of the brand will access the kits. To make the deal even sweeter, the company is adding to more products that have yet to be released to the masses. The other two products will officially launch in 2019. The second product to be released is known as A+. It will be a retinoid serum, which the brand says is similar to an upgraded Luna Sleeping Night Oil. It contains a retinol concentration of 6.5 percent. This formulation was created for those that want potency and fast results. However, for those with sensitive skin, we are recommending that users build the tolerance of their skin to retinol. Besides that, they caution users to ensure they use sunscreen all the time. To ensure there is no risk of peeling that can occur due to the high concentration of retinol, A+ has gentle natural ingredients. For instance, it contains bisabolol, a chamomile flower derivative, Hawaiian white hone. It also contains the prickly pear cactus and ginger. The third product the brand will release as part of the Early Access Kit is C.E.O Glow. This is vitamin C turmeric facial oil. It will have all the characteristics of the famous C.E.O. serum, which won the Allure Reader’s Choice award in 2018. The oil is made using THD ascorbate, which is amongst the most potent vitamin C forms is the facial care industry. It also contains vitamin E and antioxidants. C.E.O. Glow is designed for those that wish to nourish and brighten their skin. It is another worthy addition to the C.E.O. line of products. The Early Access Kit goes for $185. However, it contains $230 worth of products. 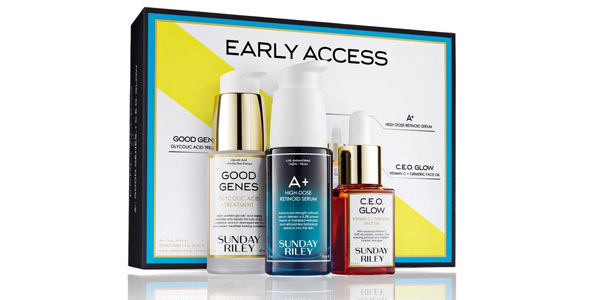 While the brand has not stated whether the UK version of Good Genes will be offered in the US, except in this kit, you should not fret if you miss out. A+ will launch in the US in 2019 and C.E.O. Glow will launch a short while later in March.